It's one thing when one artist you don't particularly like releases a new single, but when two artists you can't stand team up for a duet, it's pure hell. Welcome to my life this week in 1991. There was even more bad news this week with new songs I didn't like by two acts I normally did like. What was going on? There was no movement going on at the top of the ARIA singles chart as Divinyls held strong for a second week with "I Touch Myself". Nowhere near as good as previous Rocky soundtrack singles "Eye Of The Tiger" or "Living In America", this song from Rocky V sounded like a poor man's C&C Music Factory. Like "Giving You The Benefit", this latest US hit from producers LA Reid & Babyface, performed by a trio featuring two of the latter's brothers, flopped locally. Another song that really should've done better here is this biggest hit by the British rapper born Simone Gooden. The hook was taken from the Stevie Wonder-penned "It's A Shame" by The Spinners. On the one hand, this was a bit of a turn-up for the books. 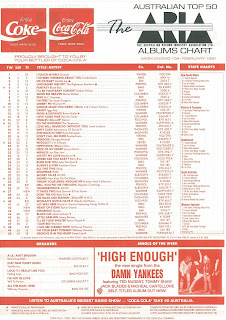 "All The Man That I Need" was only Whitney's second single back after her two-year chart break, so you might've thought it would follow "I'm Your Baby Tonight" into the top 50. On other other hand, despite being known for her big ballad voice, Whitney hadn't had a really successful slow song since "Greatest Love Of All" reached number 1 in 1986. Originally released as "All The Man I Need" in 1982 by both Linda Clifford and Sister Sledge with David Simmons, the song (with added "That") did return Whitney to the top spot in America for a ninth time. Queen's last big hit in Australia had been 1989's "I Want It All" and it, like so many other songs by the British band, had a big chorus custom-made for crowd participation. The lead single from the album of the same name, "Innuendo" had only the vaguest of hooks and a long section in the middle where it veered off into all sorts of musical diversions, including a flamenco guitar duel between Bryan May and Steve Howe from Yes. Some people compared its style-shifting and overblown pomposity to "Bohemian Rhapsody", but I just found "Innuendo" to be self-indulgent and lacking any of the excitement of their signature song. 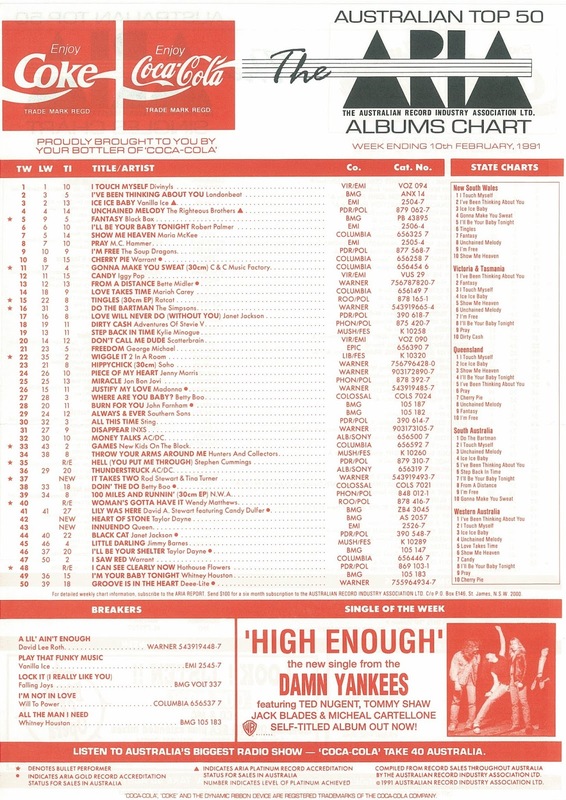 As we'll see, no other singles from Innuendo made the top 50, and it wouldn't be until after the tragic demise of Freddie Mercury later in 1991 that Queen would return to the chart with a re-release of "Bohemian Rhapsody". Not to be confused with Cher's single and album of the same name, "Heart Of Stone" became the second single in a row from Taylor Dayne that left me cold. Even though the singer who'd burst onto the scene with dance/pop singles like "Tell It To My Heart" eased back from the pop/rock stylings of previous single "I'll Be Your Shelter", "Heart Of Stone" just felt safe and ordinary. And there were better songs on album Can't Fight Fate. "Wait For Me", anyone? Instead, that ended up on the B-side. I can't have been the only one to be unimpressed, with "Heart Of Stone" not getting any higher than this debut position in Australia and becoming her first single to miss the US top 10. At least this tour through awful singles from 1991 is about to come to an end - and there was no song that bothered me more from the first few months of that year than this cover of the 1965 hit by Marvin Gaye and Kim Weston. Sounding like something Jackie Love and Ricky May might perform on Midday, Rod and Tina's version of the much-covered Motown track felt garish and unsophisticated. It probably didn't help that I hadn't enjoyed anything Tina had released since 1985's "We Don't Need Another Hero (Thunderdome)" or that I've only ever liked one Rod Stewart song ("Young Turks" from a decade earlier). 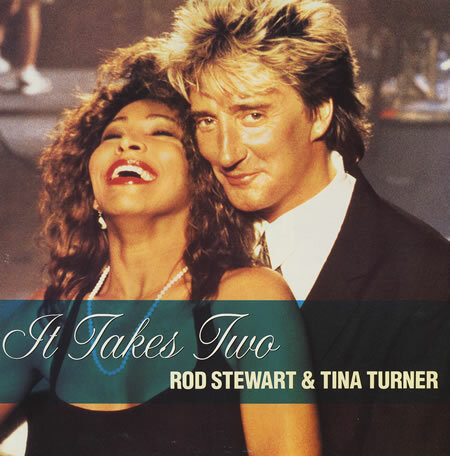 Naturally, "It Takes Two" became another big hit for both artists, aided somewhat by its use in a Pepsi commercial. Unfortunately, for me, it wasn't the last we'd hear from either singer in 1991. Next week: two cover versions debut - one by an act that'd previously hit the chart with a remake medley and the other by an artist who'd sampled his way to number 1. Plus, one of the worst ballads of all time. I don't think I heard 'Go For It! (Heart and Fire)' at the time, but I prefer to the C&C Music Factory track. 'It's a Shame' definitely deserved to do much better than #90. I didn't care much for 'Innuendo' at the time, but liked it more when hearing it again a few months ago. In hindsight it's kind of obvious that something was up with Freddie/the band, given he/they don't appear in any new footage filmed for the video. 'Heart of Stone' would be in my top 2 Taylor Dayne singles (the other being the LP version of 'I'll Wait'), so I thought it deserved to do much better. 'It Takes Two' does sound like something that would be performed on 'Midday', ha ha. Wow! That Rocky track is rather cheesy ain't it, although i'm not familiar with it I do recognize it from somewhere else and it has been bugging me all week. After 7 only had the one 'decent' track imo, which was their hit here Til You Do Me Right. The Monie Love track doesn't interest me be but the follow up did. It still surprises me the lack of chart success Whitney had here before The Bodyguard soundtrack. Or should I say chart flops? Been recently discovering or re-discovering (depends on which way you look at it) Queen's back catalog recently and this era really doesn't do much for me at all. Nor does the self titled lead single. Big miss for me was Heart Of Stone, it'd been done before Taylor. I also agree with It Takes Two being more 'classic' than first thought and I still hear it regularly on AM radio here. On a side note I really dislike Tina's vocal here.